In one of his baseball abstracts, Bill James relates an amusing anecdote about the surname change of journeyman pitcher Pete Appleton. The right-hander spent the first six years of his major league career (1927-1933) pitching for various teams under his birth name: Peter William Jablonowski. He then drifted back to the minors. Three years later, he was called back up and, now named Peter William Appleton, posted a career-best 14-9 record for the 1936 Washington Senators. At the time, it was generally reported that Pete changed his name in order to change his pitching luck.i But decades later, James published a different take on the matter. As maintained in The New Bill James Historical Baseball Abstract, the pitcher became Pete Appleton to please his new bride, one “Aldora Lesczynski” [sic] who, having already been saddled with one multi-syllabic Polish name, “just couldn’t stomach the prospect of going through the rest of her life as Aldora Lesczynski Jablonowski.”ii Although James botched the woman’s name—it was actually Aldona Leszczynski—acquaintances have informed the writer that James’s tale is not an implausible one, noting that Aldona’s brother Thaddeus Leszczynski eventually changed his name to Ted Lesh. But whatever the reason behind her husband’s name change, Mrs. Pete Appleton led a life of distinction, reaching far greater heights in her chosen professions of politics and law than her spouse ever did as a pitcher. Among other things, she was a pioneering female attorney, a significant actor in Central New Jersey political affairs, and a distinguished New Jersey judge, serving on the bench until age 88. By any measure, Aldona Appleton was much more than just a ballplayer’s wife. Aldona Eugenie Leszczynski was born in Perth Amboy, New Jersey, on September 9, 1900, the older of two children born to Thaddeus Leszczynski (1875-1941) and his wife, the former Leokadya (Lottie) Mieszkowski (1881-1952).iii Aldona’s parents separated when she was a child, and thereafter she grew up in the home of grandparents Michael and Josephine Mieszkowski, ethnic Poles who had emigrated from Czarist Russia in 1891. Grandfather Michael ran a barbershop from the family residence in Perth Amboy, hometown to a sizeable bastion of Polish émigrés. Aldona attended local public schools, graduating from Perth Amboy High School in 1918. The succeeding years were good ones for the Appletons. By 1936, Pete had worked his way back up to the majors, his contract having been purchased by the Washington Senators. Following his standout initial campaign (14-9, with 12 complete games and a 3.53 ERA), both Pete and the Senators went downhill for the rest of the decade. Still, Pete pitched well enough to hang on as a big leaguer. After going a combined 20-34 in his last three Senators seasons, Pete was traded to the Chicago White Sox in December 1939 and hurled mostly relief ball for the Pale Hose until July 1942, when he was released. Pete then signed with the St. Louis Browns, going 1-1 with a 2.96 ERA in 14 late-season appearances. In the early 1940s, Wilentz arranged Aldona’s appointment to the position of deputy clerk of the Middlesex County courts. She was also the first woman to be elected president of the Perth Amboy and Middlesex County Bar Associations. In 1952, Aldona E. Appleton was the Democratic Party candidate for New Jersey’s Fifth District congressional seat. Running against Republican Peter H. B. Frelinghuysen, II, the scion of a New Jersey political dynasty in a heavily Republican venue, Aldona had little chance of winning and was swamped that November, collecting only 37.8% of the popular vote. Still, her willingness to be a sacrificial candidate was not forgotten by her party. In July 1958, Democrat Governor Robert B. Meyner appointed Aldona to the New Jersey bench as a judge of the newly created Juvenile and Domestic Relations Court. Sworn in on September 3, 1958, Judge Appleton became only the second female jurist in state history. For the next 12 years, she would preside over the often heart-wrenching matters that came before her with diligence and compassion, ordering the incarceration of even the most incorrigible juvenile offender only as a last resort. Given Pete Appleton’s education—he was a University of Michigan graduate—and his musical talents as both a pianist and bandleader, Pete did not lack for employment options when his major league pitching career ended. In time, he also returned to school, obtaining the credentials needed for a New Jersey school teaching certificate from Rutgers University. Pete even took classes at New Jersey Law School. Yet apart from some substitute teaching during winters, Pete Appleton spent the remainder of his life in the employ of professional baseball, first as a minor league pitcher, player-manager, and then bench manager, and thereafter as a talent scout for the Washington Senators/Minnesota Twins. Meanwhile, Aldona continued her duties as a Middlesex County judge until reaching the mandatory judicial retirement age of 70 in 1970. Shortly after Aldona’s retirement from the bench on October 1, the Appletons moved their home to nearby Colonia, New Jersey, as Pete continued his scouting assignments. In the spring of 1973, Pete was placed in charge of the Twins minor league camp in Melbourne, Florida. Soon thereafter, his health began to deteriorate. Diagnosed with cancer, he was later admitted to St. Francis Hospital in Trenton where he died on January 18, 1974, at age 69. Following funeral services, Pete Appleton was interred next to Aldona’s mother at St. Gertrude’s Cemetery in Colonia. A year later, Aldona’s grief was multiplied by the death of her only sibling, brother Ted Lesh. To combat the effects of loneliness and depression, Aldona subsequently accepted a longstanding offer to return to the Middlesex County bench as a retired judge on temporary recall.xi Given her experience handling family-related related matters, Judge Appleton was assigned to the court unaffectionately known as “Pay or Stay,” where those delinquent in alimony or child support payments are generally afforded the option of satisfying their arrearages or going to jail. Commencing in 1975, this “temporary” return to judicial duty would last for the next 14 years, during which time courthouse observers would marvel at the efficiency and finesse this now elderly jurist brought to her difficult (and often disputatious) judicial post. And characteristically, Judge Appleton sought payment solutions, rather than imposing incarceration, whenever possible, no matter how large the deadbeat hauled before her. In August 1987, Aldona Appleton, now 86 years old, expressed her appreciation for the recall assignment, telling the New York Times, “If I am not working, I doubt if I’d be around at all.”xii Besides, she added, there was so much work for the county’s judges to do and “I happen to have the experience and I love what I am doing—helping children and families that have problems.”xiii Judge Appleton continued her duties for another two years, retiring from the bench for good in 1989. On April 17, 1997, Aldona Leszczynski Appleton died quietly at her retirement home in Cranbury, New Jersey. She was 96. Tributes from colleagues flowed in on her passing. 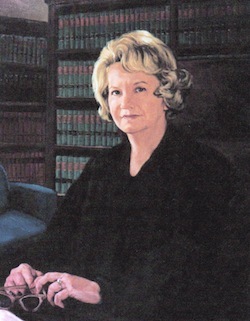 New Jersey Superior Court Judge Joseph F. Deegan, Jr., a fellow Perth Amboy native, remembered Aldona as “a very gracious lady and a compassionate judge [who would] be missed by all who knew her,” while her friend Judge Martin Kravarik recalled that Judge Appleton “believed being a judge was the highest calling in the world.”xiv Following a Funeral Mass at St. Stephen’s Church, Aldona was laid to rest besides her husband and mother at St. Gertrude’s Cemetery. Without children, she was survived by sister-in-law Helen Lesh and Pete’s youngest brother, Alex S. Jablonowski, Jr.
During her lifetime, Judge Appleton had been honored by organizations including the New Jersey Association of Chosen Freeholders, the New Jersey Catholic and Jewish War Veterans associations, the New Jersey Chiefs of Police Association, and the New Jersey Association of Free Public Libraries, often being feted as their “The Woman of the Year.”xv To preserve the memory of this selfless and dedicated attorney/jurist after her death, the Middlesex County Bar Association subsequently named its annual laurel for women achieving excellence in the legal profession the Aldona E. Appleton Award. And in Spring 2001, Middlesex County dedicated a handsome new five-story courthouse building, its foyer graced by a large oil painting of Judge Aldona E. Appleton, the judicial pioneer who served as the county’s first juvenile and family court judge – a fitting reminder of a woman who was far more than just a ballplayer’s wife. The writer, a retired 27-year member of the Middlesex County Prosecutor’s Office, was introduced to Judge Appleton in 1980, but never appeared in court before her and knew her only slightly. The biographical aspects of this profile have been drawn largely from US Census data, the extensive Aldona Appleton obituaries published in The (Newark) Star-Ledger and The (East Brunswick, NJ) Home News Tribune, and the reminiscences of New Jersey Superior Court Judge Martin Kravarik, distinguished Woodbridge attorney Warren W. Wilentz, and other colleagues and acquaintances of Judge Appleton who spoke to the writer after the Bill James anecdote about Pete Appleton’s name change was published in 2001.
i In the alternative, it has been reported that Pete decided that his ethnic surname was unfitting for the American national pastime (Shirley Povich, Washington Post, March 5, 1936), or that the name Jablonowski would be an impediment to his future career as a bandleader. The Sporting News, February 2, 1974.
ii Bill James, The New Bill James Historical Baseball Abstract (New York: The Free Press, 2001), 158.
iii According to US Census notations, Thaddeus Bronislaw Leszczynski was an ethnic Pole who emigrated from the Austro-Hungarian Empire to the United States in 1888. He married Lottie Mieszkowski in 1900, and their second child, a son born in 1907, was named for his father. By 1910, Thaddeus, Sr., had separated from his family and taken up residence as a boarder in Newark. He later moved to Chicago where he remarried and worked as an insurance agent until his death in 1941. During those years and then afterward, Aldona’s mother would inform local census takers that she was a widow. iv The 1929 Middlesex County Bar Association photo was long on display in the civil assignment clerk’s office at the courthouse. v For a detailed exposition of his professional playing career, see the BioProject profile of Pete Appleton. vi While the Polish surname Jablonowski roughly translates into Appleton in English, the actual reason why Pete changed his name is uncertain, as discussed above. vii Pete Appleton obituary, The (Woodbridge, NJ) News-Tribune, January 19, 1974.
viii Overall, Pete went 57-66 (.463), with a 4.30 ERA in 1,141 major league innings pitched. Breaking the record down another way, he went 17-19 in 121 major league games as Pete Jablonowski (1927-1933) and later 40-47 in 210 games as Pete Appleton (1936-1942, 1945). ix During the 1930s, Aldona’s brother Thaddeus (later Ted Lesh), also a Middlesex County attorney, served as a clerk to David T. Wilentz while Aldona often babysat the three Wilentz children, all of whom would go on to lead prominent lives in their own right. xAs recalled by New Jersey Superior Court Judge Martin Kravarik at the time of Aldona’s death. See The (Newark) Star-Ledger, April 18, 1997.
xi In New Jersey, vacant judicial positions are oftentimes filled by the recall of a retired judge. The physical and mental fitness of retirees must be certified by a physician, and the recall must be approved by the New Jersey Supreme Court. Judicial recall orders are of two years’ duration but can be renewed indefinitely. In the case of Judge Appleton, her recall was approved seven times. xii New York Times, August 6, 1987.
xiv As noted by The (East Brunswick, NJ) Home News Tribune, April 18, 1997.